Today's the day. Of course we're all here for Holland in Tulip Time but the tipping point for this trip is the simple fact that this year ends in a "2." And that, my dear reader, means that this is a Floriade year. 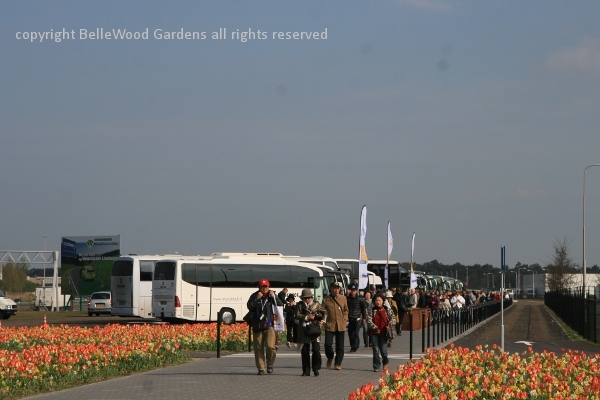 In case you did not know, the Floriade is a once-every-ten-years horticultural extravaganza. It's a major undertaking for which communities submit bids. The lucky winner then produces an A1 Horticultural Expo with world-wide recognition. This year's theme is Be part of the theatre in nature, get closer to the quality of life. Sixty six hectares, that's 166 acres. A huge amount of ground to cover. 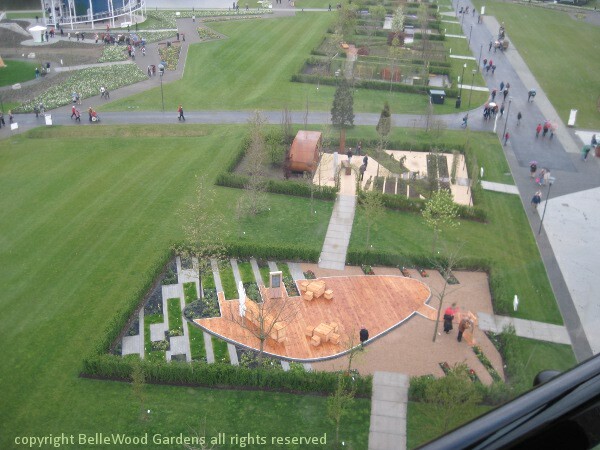 Five themed areas: the environment, green engine, relax and heal, education and innovation, and the world show stage. 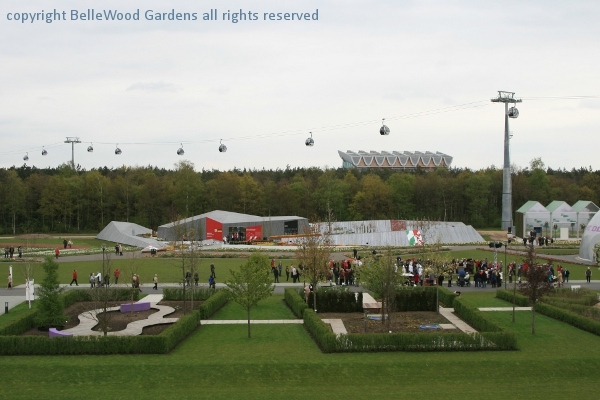 Open from 5 April until 7 October 2012, it will have as its legacy Venlo GreenPark, a green business park. This will be a major but independent part of Greenport Venlo, second largest concentration of horticulture in the Netherlands. Product, process, market innovation in all links of the agro-food chain from food, feed, flowers to trading and processing. Yes, fine, well and good. But today, today we're here for the Floriade. And we're not alone. that makes right now such a hot spot tourist destination time. Hey, that's why I'm here too. 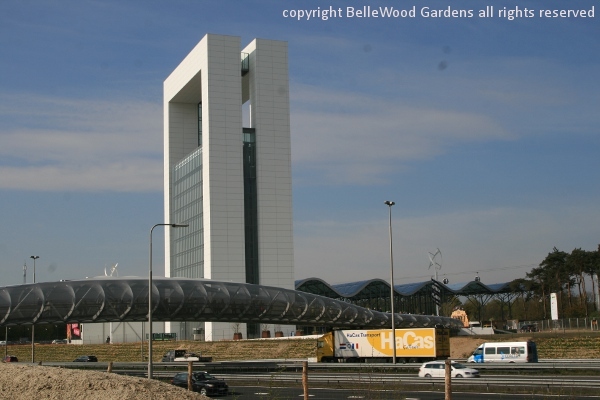 two that will remain when it transforms to the Venlo GreenPark. It's a good landmark. to the Floriade. We're given a map to help us ramble around. 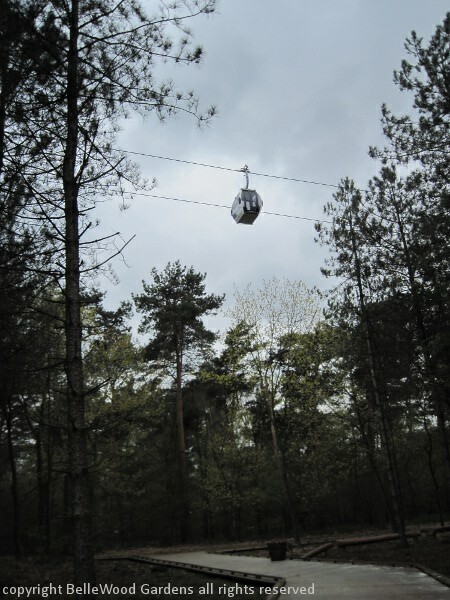 There's an aerial tram more than half a mile long. Our tour-provided tickets include a one-way tram ride. Carol and I agree that it makes more sense to work our way to the furthest tram station, ride back to the entrance. Here are a few overhead views to provide you with some perspective and an understanding of why we couldn't / didn't see everything. a roomy cafe serving a couple of kinds of soup, sandwiches, coffee, etc in disposable containers. Bloomin' Holland Flower Innovations Pavilion. Don't waste your time with that one. 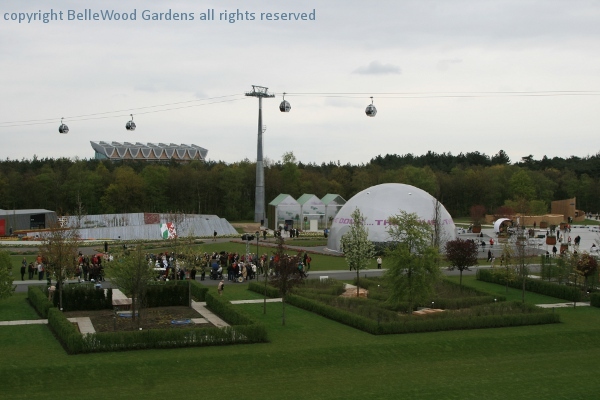 Now the tram is passing over The Avenue of Garden Cultures, an avenue of 120 different and unusual tree species overlooking 15 charming gardens, each offering an interpretation of the office garden in 2012. Each one covers an area of about 3,767 feet square. Display gardens by Plan 10 Garden Design, De Vries Garden Design Company, Feddes / Olthof landscape architects, and other garden companies: Estonian, Japanese, Belgian, German, and Luxembourg garden designers. 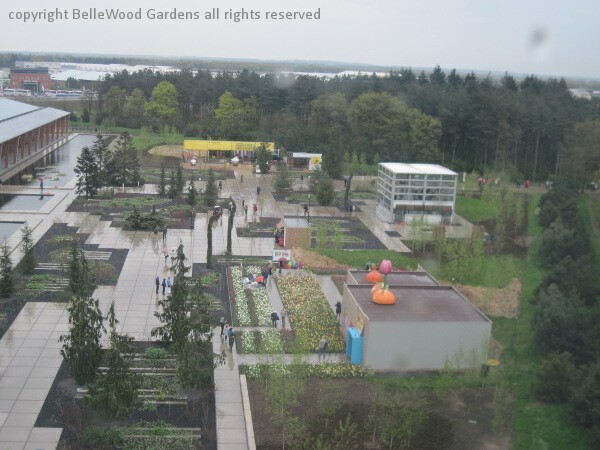 The gardens give a general picture of garden design in the Netherlands and elsewhere. 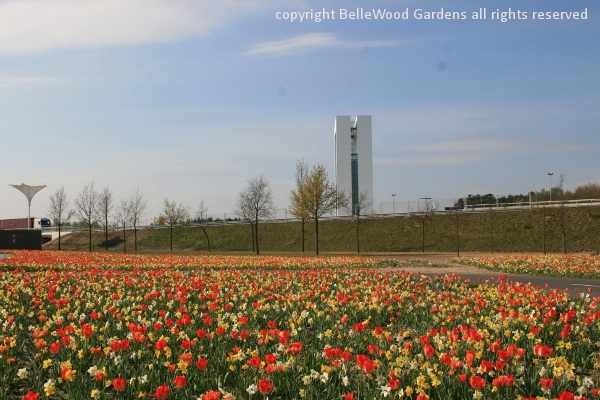 And when the Floriade becomes Venlo GreenPark these will become office gardens in reality. Don't ignore that blue building in the upper left of the image. It's the Rabobank Earthwalk. A hemisphere, you walk up a gently sloping ramp on the outside of the sphere, stopping partway up for an obligatory show in a darkened auditorium. Not suitable for people with heart conditions or epileptics, a sign warns. Why? Because a spectacular film plays underfoot, intended to provide an experience of the flows that transverse the globe every day - how people work the land and how flows of food, water, energy, and information are created. Spectacular is the correct word, for sure. Then complete the walk up to the roof, look out over a portion of the Floriade, and read some informative text about ten enterprising individuals whose local initiatives have made global impacts, contributing to make the world better, more prosperous and/or more sustainable, both successful and appealing. film that provides a look at the diversity and riches of horticulture in the Netherlands. Comments: And this IS really just an overview. 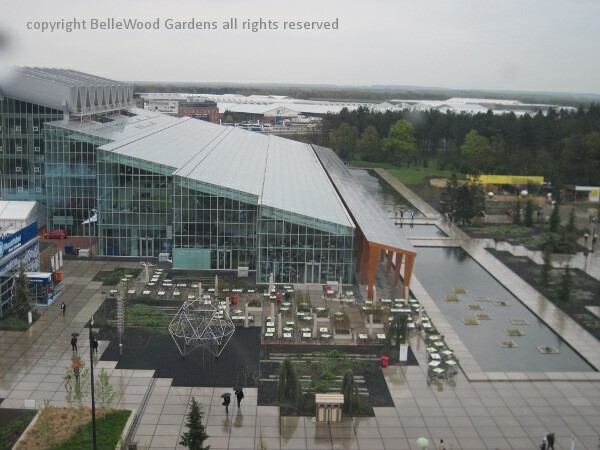 You can enjoy the Floriade for its pretty flowers, attractive garden displays, and entertaining features. You can do all that and also take away something more, about sustainabilty, environmental impacts, and the green world.